DONETSK/SLAVYANSK, Ukraine -- Ukrainian leader Oleksander Turchinov accused Russia of working to overthrow legitimate state power in Ukraine on Monday after pro-Russian rebels declared a resounding victory in a rebel referendum on self-rule in eastern regions. A gunman stands guard as local residents walk from a polling station in Slavyansk, eastern Ukraine, Sunday, May 11, 2014. Residents of two restive regions in eastern Ukraine engulfed by a pro-Russian insurgency cast votes Sunday in contentious and hastily organized independence referendums, which have been rejected as illegal by the Ukrainian government and the West. Russia said it respected the outcome of the referendum, in which separatists in the industrial Donetsk region claimed 90 percent support, and that the results should be implemented peacefully. It did not say what further action it might take. Hours after the vote, dismissed by Kiev and Western governments as illegal, rebel leaders' plans remained unclear. Some have publicly supported pressing for annexation by Russia, which absorbed Crimea after a similar vote in March. 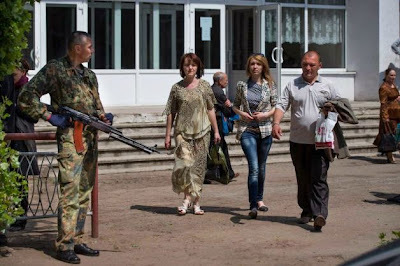 "This land was never Ukraine ... we speak Russian," said Vyacheslav Ponomaryov, rebel mayor of the separatist stronghold of Slaviansk, threatening to kick out the Ukrainian army. Asked about the possibility of holding a second referendum, on union with Russia, he said: "There has been no decision, but this referendum showed we are prepared ... we can put on an election or referendum at short notice at barely any cost." Interior Minister Arsen Avakov said rebel forces had made a new attempt overnight to seize a television tower on the edge of Slaviansk, heartland of a rebellion that has widened the worst standoff between Russia and the West worst since the Cold War. "The information war that they are waging against us in the Donbass (east) is more dangerous than a bullet. We must answer back ... the enemy fears this more than special forces," he wrote on Facebook. But there was some hint of compromise in the port city of Mariupol, scene of fierce fighting between Ukrainian forces and rebels over the last week. Turchinov said local police had begun patrols with a volunteer militia set up by a company, Metinvest, mostly owned by Ukraine's wealthiest businessman, Rinat Akhmetov. His words implicitly endorsed the arrangement. A photograph on the company's website showed steelworkers from his company, dressed in working overalls and helmets, but unarmed, walking with police through city streets. Akhmetov had offered to provide the militia as part of an arrangement with loyalist police to restore order in the city. Akhmetov had also proposed that the military should not be brought again into Mariupol. RUSSIA RESPECTS "WILL OF THE PEOPLE"
Turchinov made no mention of this part of Akhmetov's proposals but dismissed the separatist vote as a farce. "These processes are inspired by the leadership of the Russian Federation and are destructive to the Donetsk and Luhansk regions' economies, threaten the lives and welfare of citizens and have the aim of destabilizing the situation in Ukraine, disrupting (May 25) presidential elections and overthrowing Ukrainian authorities," he said in a statement. The presidential vote is intended to secure democratic continuity and legitimacy following Yanukovich's flight to Moscow in February. The referendum opened a new phase of uncertainty in a country historically divided between a Russian-speaking east and a more westward looking west. One man was killed in a confrontation on Sunday between a National Guard unit and a crowd of pro-Russian activists. The authorities are wary of the danger of clashes between security forces and crowds that could stir wider bloodshed. Russian President Vladimir Putin did not comment personally at a state residence in the Black Sea resort of Sochi but the Kremlin released a statement on the referendum. "We condemn the use of force, including of heavy weapons against civilians ... in Moscow, we respect the will of the people of the Donetsk and Luhansk regions and are counting on practical implementation of the outcome of the referendum in a civilized manner, without any repeat of violence and through dialogue," it said. The European Union declared the referendum illegal and prepared to increase pressure on Russia on Monday by taking a first step towards extending sanctions to companies, as well as people, linked to Moscow's annexation of Crimea from Ukraine. EU officials have prepared a list of 14 people and two Crimean companies active in the energy sector that ministers are likely to add to the EU sanctions list, EU diplomats said. But the EU will remain far behind the United States in the severity of the sanctions it has imposed on Russia. Some European governments fear tough trade sanctions on Russia could undermine their own economies, just recovering from the financial crisis, and provoke Russian retaliation. Moscow denies any ambitions to absorb the mainly Russian-speaking east, an industrial hub, into the Russian Federation following its annexation of Crimea after a referendum on the Black Sea peninsula in March. The Ukrainian government came to power when President Viktor Yanukovich was toppled in February after mass protests in Kiev. One leading separatist said Ukrainian troops in the east would be declared illegal occupiers. "It is necessary to form state bodies and military authorities as soon as possible," Denis Pushilin, a leader of the self-styled Donetsk republic said. Roman Lyagin, head of the rebel central electoral commission in Donetsk, also took a strong position on the results. "That can be considered the final and official result," he said, reporting 89.07 percent for and 10.19 percent against. "We demand the right to self-determination, and we will get it." "With the announcement of the results, the status of the Donetsk region does not change in absolute terms. We do not cease to be a part of Ukraine, we do not become a part of Russia," he said, although he left those options open. Moscow has massed troops on the border and Kiev fears they may be called in as peacekeepers. Serhiy Pashinsky, head of the Ukrainian presidential administration, said a column of armored vehicles on the Russian side of the border bore the colors of U.N. peacekeeping forces. He offered no evidence or detail.